In a brightly lit room, workers donning head-to-toe protective clothing — white jumpsuits, blue bouffant caps, surgical masks, booties and gloves — huddle over tables lined with trays. The environment could pass as a research lab or sterile-processing center deep inside a bustling hospital, but it’s neither. The trays contain the mission behind this quiet room: Seeds. And lots of them, in perfectly arranged rows. This is the seeding room at Oasis Biotech, an indoor hydroponic farm in Las Vegas that’s gearing up to ship its crops to restaurants on the casino-dotted Strip. It’s the first step in a new-age farming process that doesn’t carry the traditional trappings of the industry. No soil, tractors or natural sunlight exist in this 215,000-square-foot-building-turned-farm. And as far as Brock Leach, the facility’s chief operating officer and general manager, is concerned, that’s a step in the right direction. He points to worldwide population growth, climate changes and land challenges as reasons why indoor farming is becoming increasingly important. That improvement is already underway. Several weeks ago, workers were assembling 145 seed-filled trays per day, Leach said. On this day, they’re poised to produce 1,045 that will birth crops such as baby arugula, microgreens and red butter head. As of last year, Nevada contained nearly 250 farms, which includes both indoor and outdoor operations. Most are small or medium-sized farms that pump out everything from potatoes and onions to watermelon and cantaloupe, said Jennifer Ott, plant industry division administrator for the Nevada Department of Agriculture. “We actually have a pretty thriving melon industry in Nevada,” she said. But to the Las Vegas resident or tourist who doesn’t venture too far beyond the suburban ring, it might not be very obvious. Many of the farms exist in Northern Nevada, in Churchill and Lyon counties, and others are clustered east of Las Vegas in the Moapa Valley. State officials said the farming industry has grown in recent years. 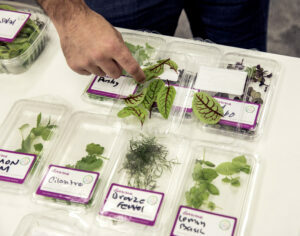 They expect that trend to continue, especially as indoor farming becomes more popular. It’s a belief echoed by Leach as Oasis Biotech prepares to enter the scene. The fledgling company’s roots are half a world away: San’an Optoelectronics Co., a Chinese company that is the world’s largest producer of LED chips, owns Oasis Biotech. 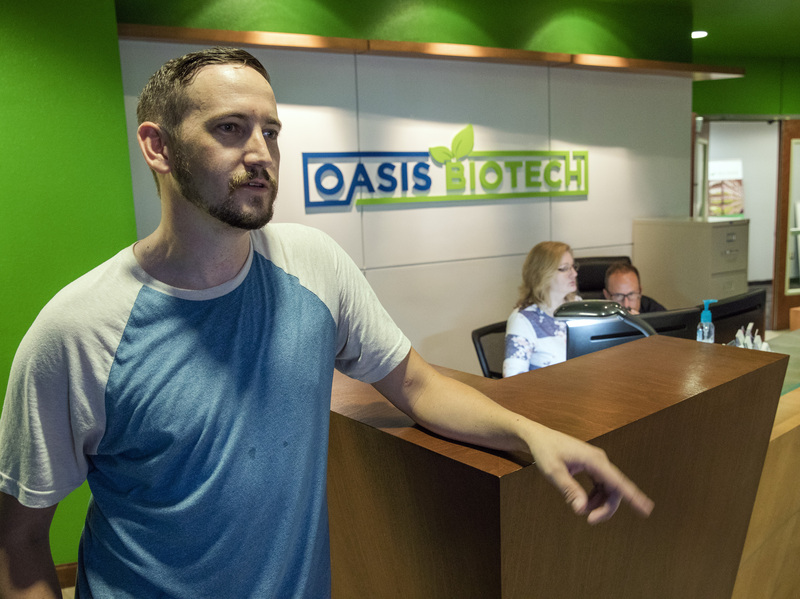 Founded in 2017, Oasis Biotech wants to help feed the world through its massive hydroponic, vertical-farming facility located in a warehouse district in southeast Las Vegas. The plants grow in a nutrient-rich solution, and the seed-to-harvest process all happens inside this massive building, which once served as home to a mail-order pharmaceutical company. Now, white hallways lead to temperature-controlled germination and growing rooms, where the seeds come to life. As long as farming can be done outdoors, he thinks it will. But Leach considers indoor farming wise preparation for the future. “It would be foolish for us not to invest and develop in this technology,” he said. After all, roughly 124 million people in 51 countries endure food insecurity or worse, according to the 2018 Global Report on Food Crises, produced yearly by the Food Security Information Network with help from other global agencies. That’s a 15 percent increase over the prior year. The report notes that long-lasting conflicts and climate disasters, such as droughts, have contributed to the problem. The food produced in Oasis Biotech’s indoor farm won’t directly feed the hungry in the most food-insecure nations, but Leach said the operation can indirectly help by fine-tuning indoor farming, thus making it a more common practice. “Our intent is to help other people engage in this industry by supplying our expertise,” he said. Decreases in the cost of LED lights paired with an increased desire for locally grown food have spurred the expansion of the indoor farming industry, according to a 2017 report by Agrilyst, a software provider for indoor farmers. Of operation types, indoor vertical farms led the pack in growth last year. And many, like Oasis Biotech, are growing leafy greens and microgreens — crops that have a shorter grow cycle and higher profit margin. The long-term plan: produce delivered to local grocery stories. The company is hosting a grand opening Wednesday for invited guests, followed by a public event Saturday when community members can tour the facility and sample produce. The first distribution to paying customers will occur July 24, Leach said. Oasis Biotech expects to produce 12,000 servings of salad a day during its initial operational phase, he said. Phase two would quadruple that output. Eventually, the company expects to grow strawberries, raspberries, beets and radishes, among other crops, in the same building. Vast, open rooms await the planned crops. So far, Oasis Biotech has hired more than 100 people and plans to invest nearly $30 million in the Southern Nevada economy during its inaugural year. The workers include farm hands, data scientists, plant physiologists, salespeople and maintenance crews. 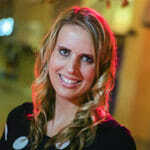 Among them is Dustin Wanders, a 34-year-old who grew up on his family’s potato farm in Caldwell, Idaho. He recently traded his outdoor farming lifestyle for a new gig as grow room supervisor at Oasis Biotech. Wanders said his father and brother originally thought he just wanted to forgo the farming career. But that’s not the case. The new Las Vegas resident said he developed a fascination with indoor farming and began applying for jobs across the country. Wanders has a leg up compared to many of the indoor farm workers. Leach said many don’t have prior farming experience, much less in an indoor hydroponic facility, so they’re learning a new skill set. The best way to teach them? “By putting them to work,” he said. Educational partnerships could sprout in the future. A large group from UNLV recently toured the facility. In the meantime, Leach said he hopes Oasis Biotech’s presence in Las Vegas at least educates the broader community about indoor farming and its benefits. The grow method and production process, he said, yield fresher produce in a recycled environment that uses less water.